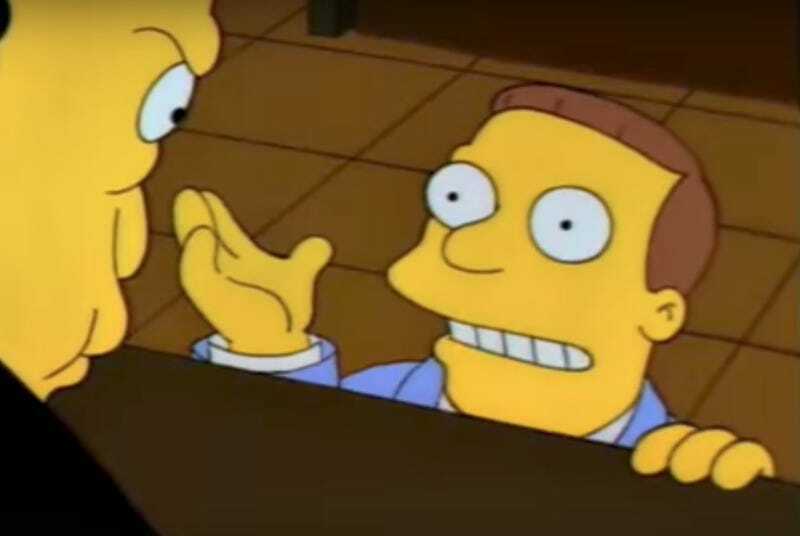 Lionel Hutz, the ineffectual attorney whose clientele consisted entirely of Homer and his family, remains a Simpsons fan favorite. Voiced by the late Phil Hartman, the bumbling lawyer was inept on a good day, and almost disbarred on a bad one. And when he wasn’t calling for a “bad court thingy,” he was working as a babysitter or cobbler. Hartman’s voice work lent the grossly incompetent Hutz a lot of his charm, which is why the character was retired, along with Troy McClure, after Hartman was killed in 1998. Lawyers have grown nominally more capable on the show since, but nowhere near as delightfully smarmy. Now an unearthed script for an unproduced Hutz storyline is making the rounds. Former Simpsons writer, EP, and showrunner Josh Weinstein wrote for Hartman during his tenure, including the idea that was ultimately cut from “22 Short Films About Springfield,” which he posted to Twitter yesterday.